I just heard about a Twitter Scam. I guess it comes via e-mail and sends you to a site that looks like Twitter... but it isn't. 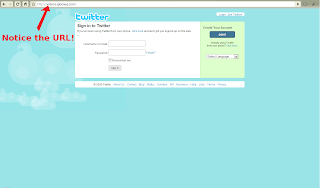 You are asked to sign in, so when you do, this site obtains your username and password! I learned about this particular scam through Free Technology for Teachers. 20 years ago, this Halloween, I went on a date with a beautiful girl. If that girl's name wasn't Charity, I could get into trouble for this post... but it is, and I can honestly say that I love her more today than I have at any other time. It just continues to grow and develop in ways I couldn't have imagined. I was driving home a couple of months ago and I was listening to the song, Hey there Delilah, thinking about my wife. I don't know why. My wife wasn't in New York... I wasn't a thousand miles away... And I most definitely couldn't pay the bills with my guitar! But there was just something about it that reminded me of her. In our Adult Sunday School Class we are going through R.A. Torrey's book on prayer. It has been OK, but not my favorite old book. The concept of prayer, and our discussions on prayer have been really good though. I have thought more about my prayer life in the last few months than I have at any other time in my life. I have been convicted at my lack of prayer and motivated to question what it is that I am really praying for. For example, when I pray for the church, and I pray that God will bring visitors: The reality is that I am praying for some change within myself and those around me. I am praying that God will make me the sort of person who is sharing the truth of the Gospel... unashamedly. Just like when Jesus encourages his disciples to pray for workers in the harvest, and then turns around and sends those same disciples out to work (Matthew 9:35-10:10). Even though God can use a phone book to bring people to church (which happened... another story for another blog), I believe that he delights in using us. It is only when we don't bring Him glory that the stones begin to cry out! I am also praying, when I pray for church growth, that this church will be God's kind of church. I mean, if you are asking God to bring people to your church, there is the assumption that God would want people to be at that church. Are we really God's kind of Church? Is His truth being taught? Do we emphasize the things that He emphasizes? Do we respond to sin the way He responded to sin? Do we forgive the way He forgives? Do we Love the way He loves and has loved us? If we want people to come to our church, it should be because we believe that when they come... That they will really see God! So, do you pray? Do you really pray that sort of prayer that willingly and with great desire, seeks the Holy Spirit to intervene in such a way that we will be praying God's will and His work. The Shepherd's Fellowship shared an article by J.C. Ryle titled, "Do You Pray?" I would like to encourage you to visit, give it a read, and ask yourself the question, Do You Pray? Democrats in the U.S. House and Senate have spent the spring, summer and fall grappling with how to fix the health care system. They're still trying to craft a bill they can sell to Americans -- or even explain in plain English. And the Republicans? Well, as the minority party, they're mainly on the sidelines. They've become the party of "no," sniping at every Democratic health care reform idea without promoting any of their own. Right? Over the summer and fall, Republicans in the House and Senate have introduced six -- yes, six -- health care reform proposals. You didn't hear? Well, those plans didn't produce much of a ripple because Democrats dominate the Congress. Six Health Care Reform Proposals from the Republican party. I haven't heard about any of them! Have you? It is amazing to me how one sided the media is! 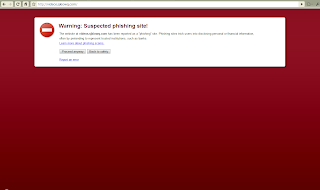 Jim DeMint's blog has the same article. I just received my invitation to preview Google Wave. If you would like an invitation to Google Wave, let me know. I have 18 invites remaining. 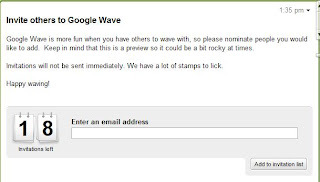 I don't think they send you something right away, but according to them, "Google Wave is more fun when you have others to wave with..."
Leave your e-mail in the comments or e-mail me. If you are already using Google Wave, wave me something or add me to your contacts! Yesterday's sermon came from Matthew 5:17-20. I have been impressed so much with the truth of the Gospel as I have gone through the Sermon on the Mount and this week hasn't been any different. I did feel that this week's could have been a little controversial, but I haven't heard any negative reports yet. If you would like to take a listen, you can find the audio of all of the Sermon on the Mount sermons by clicking here. Feel free to give me your thoughts or opinions in the comments section. If you would like to subscribe to all of the sermons from Edgewood, then visit this blog: http://audio.edgewood-danville.org. We are still doing a little research before we make an offer, but we are leaning in this direction. I am going to find out about the power bills today, and we are doing a little background research on the neighborhood. It is a really cool house. There is one full bath and two half baths, three bedrooms, living room, dining room, sun room, attached garage, plus... the basement is basically like a one bedroom apartment, complete with kitchen... Then there is a finished attic with a spiral staircase in one of the bedrooms going up to the top. It is also a quirky, odd house. My wife, of course, loves it. I just struggle with the other stuff: What direction is the neighborhood going? Is it going to be a money pit? Can my wife take a walk and feel safe? etc. I have been preaching through the Sermon on the Mount at Church. It has been really good so far... not necessarily the preaching... but what it is doing in me. I have been learning so much about the truth of the Gospel that is wrapped up in every little spot of the Sermon on the Mount. Every time I study the next passage I feel like another little light bulb has been turned on in this big room. It is similar to the experience of turning lights on in a gym. Especially one of those old gymnasiums where the lights come on a little at a time. As each one flickers into its own brilliance, the features of the room become more clear. "The more I read these three chapters– Matthew 5,6, and 7– the more I am both drawn to them and shamed by them. Their brilliant light draws me like a moth to a spotlight; but the light is so bright it sears and burns. No room is left for forms of piety which are nothing more than veneer and sham." That quote summed up so much of what I am experiencing as I read and study this sermon, so I thought I would share it with you. What have you been reading lately? How has God's word been "burning" itself in and upon you? Just recently, I made the switch to the ESV. I think that I did a post on it a few weeks ago, but I wanted to mention some more about it. For those of you who don't already know, the ESV is the English Standard Version of the Bible. If you are a reader of this blog and you fall into the KJV Only camp... I hate to disappoint, but I am most definitely not in that camp. In fact, I don't really even visit that camp anymore and I may have even moved myself to the KJV Hardly Ever camp. I don't mean any offense to the King James Translators. I really admire what they did and would uphold their translation philosophy. I would even go as far as to say that by switching to the ESV I am more in line with what the King James translators were trying to do than those people who cling to the King James Version. "The true heirs of the King James translators are those who continue their task today, not those who declare it to have been definitively concluded in 1611." In fact, I would suggest going on to their website and reading their stuff instead of listening to anything else that I have to say. Here are a couple of links to different pages on their website that I found especially interesting. How is the ESV different from other Bible translations?